Jackson, E, & Schwartz, K. (2008). 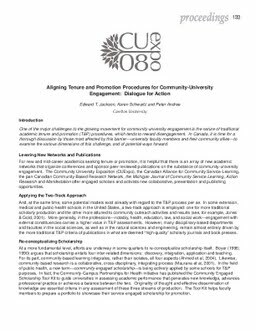 Aligning Tenure and Promotion Procedures for Community-University Engagement: Dialogue for Action. In Community-University Partnerships: Connecting for Change. Proceedings of the Third International Community-University Exposition (CUexpo 2008), edited by Darlene E. Clover and Catherine McGregor. May 2008 University of Victoria, Canada (pp. 133–134). Community-Campus Partnerships for Health (CCPH).